The Voyage is an excellent roller coaster in Thanksgiving and one of the best attractions at Holiday World. The minimum height to ride is 48 inches. This hybrid wooden coaster from The Gravity Group debuted at the Santa Claus, Indiana theme park in 2006, as the anchor of the park's Thanksgiving land. Themed to the Pilgrims' voyage across the Atlantic Ocean, The Voyage offers all the thrills that one would expect from a tempest-tossed ocean crossing. This 1.2-mile coaster provides five underground tunnels, three 90-degree banked turns, dramatic drops, and multiple track crossovers at a maximum speed of 67 mph. The Voyage is situated at the back of the park in the Thanksgiving area. It is a beautiful collection of wood measuring 1.2 miles in length and if it is not the best wooden coaster in the nation, it is definitely in the top two. Amazing and unrelenting from start to finish, the Voyage is loaded with drops, 90-degree turns, tunnels, and air time moments. This coaster is an absolute monster! 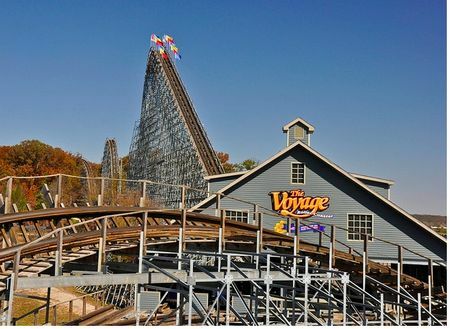 If you are a wooden coaster fan you owe it to yourself to ride The Voyage. It is worth the price of admission. Outstanding.